Senate Move to Reverse Mercury Rule Fails | "Global Possibilities"
A Senate resolution seeking to reverse federal regulations limiting emissions of mercury and other toxic substances from coal-burning power plants failed to win passage on Wednesday. The resolution, introduced by Senator James M. Inhofe, an Oklahoma Republican, won support from 46 senators; 53 voted against it. The Environmental Protection Agency rules, issued late last year, have been criticized by some utilities, coal producers, Congressional Republicans and other foes as overly broad and potentially harmful to the economy. The Obama administration has defended the new regulations as critical to protecting public health. 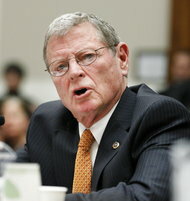 Mr. Inhofe argued that the regulations amounted to a “war on coal” that would result in job losses and higher energy prices. Mitt Romney, the presumptive Republican presidential nominee, has also opposed the rule on economic grounds. But President Obama cited the rule limiting emissions from power plants as a signal achievement in his State of the Union address in January, and the White House warned this week that he would veto the resolution if it landed on his desk. Opposition from the Senate’s Democratic majority ensured that it wouldn’t come to that: only five Democratic senators supported the resolution, including Senator Joe Manchin III of West Virginia.